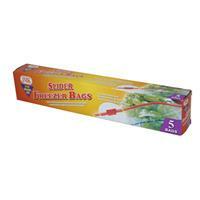 Wholesale 5pc SLIDER 2.5 GAL FREZER BAGS. Innovative slide-lock securely closes the bag to guard against spills and leaks. Easy to open and close, just slide the plastic tab along the top! Perfect for freezing meat, poultry, fish, vegetables and more. Helps to preserve original flavor. Includes a printed area to write contents and dates. 8.27" x 17.32" x 15.35"